A successful but demanding father turns against his own child in You Will Be My Son , the stirring new dramatic thriller starring Niels Arestrup in an unforgettable performance. The Cesar-nominatedfilm arrives on Blu-ray and DVD from Cohen Media Group on Blu-ray and DVD on February 25, 2014, with SRPs, respectively, of $34.98 and $24.98. Director Gilles Legrand (The Maiden and the Wolves) creates a powerful and moving drama with echoes of nothing less than King Lear and the novels of Balzac. The elderly Paul de Marseul (Niels Arestrup, War Horse, A Prophet, The Beat That My Heart Skipped) is the passionate but abusive proprietor of his prestigious family wine estate in the Bordeaux region. Paul lords it over all his employees, and that includes his son Martin (Lorant Deutsch, Humans, Asterix and the Vikings), who works at the vineyard in administration and sales. Paul has no faith in Martin's ability to take over the operation after he's gone, and he never misses a chance to belittle his son and his university education, even when Martin secures a lucrative export deal for the winery. A lifetime of being treated like a servant has made the clearly competent Martin into a nervous, uncertain adult. Paul wishes he had a different son to leave his empire to - a wish that seemingly comes true when he meets Philippe (Nicolas Bridet, Regular Lovers, Mr. Bean's Holiday), the son of his trusted estate manager (Patrick Chesnais, The Diving Bell and the Butterfly). The handsome and charismatic Philippe has arrived home from California (where, it seems, he's a rising star in Francis Ford Coppola's Napa Valley wine empire!) to care for his father, who is dying of cancer. Immediately, a rivalry between Martin and Philippe is set in place. Does the scheming Paul have the legal means - let alone the heart - to turn against his own faithful, hard-working son Martin and somehow make the ambitious and talented Philippe the rightful heir to the estate? 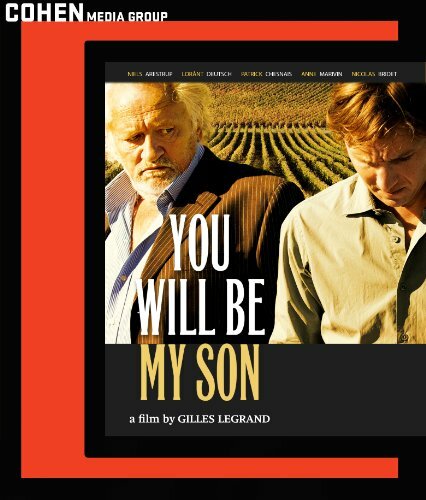 You Will Be My Son , a Cohen Media Group theatrical release, received high marks from critics everywhere. The New York Observer's Matthew Kassel called it "a slick psychological thriller." "Gorgeous, robust and suspenseful," said Doris Toumarkine of Film Journal International. Time Out New York's Eric Hynes gave the film four stars, writing, "Evoking a contemporary fable but unfolding like a thriller, [the film] is most of all a devastatingly realistic depiction of the festering resentments shared between a father and son." The New York Times' Stephen Holden called it a "beautifully acted movie," while Empire's David Parkinson said, "Lustrous photography and a fine cast make this dark drama a compelling one." And Hannah McGill, reviewing the film in Sight & Sound, singled out Lorant Deutsch as kindly son Martin: "Deutsch's performance - never ingratiating but often excruciatingly moving - captures all the grief and confusion of never quite being good enough for one's paterfamilias." Bonus material on both the Blu-ray and DVD includes deleted scenes and interviews.